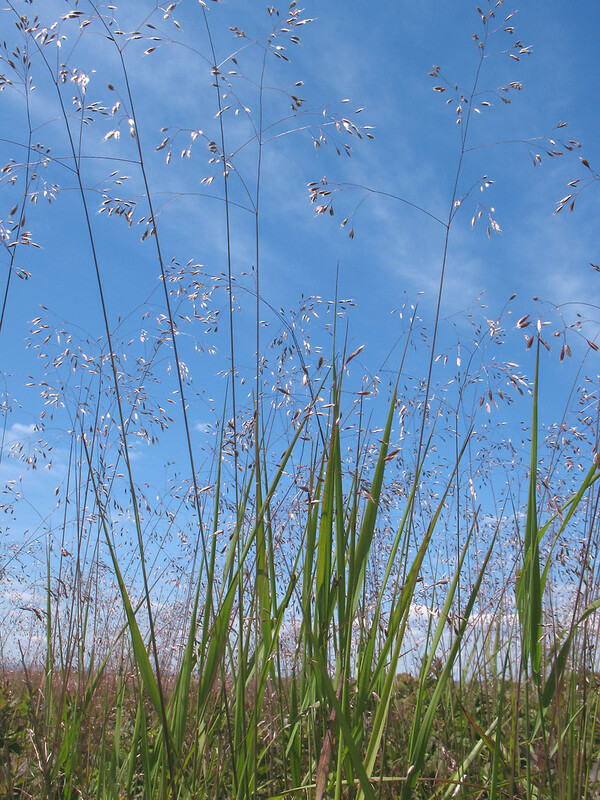 Deschampsia flexuosa plants. By Marilee Lovit. Copyright © 2018 Marilee Lovit. New England Wild Flower Society. gobotany.newenglandwild.org (Accessed 2/2018). Deschampsia flexuosa is a perennial C3 grass (Waller and Lewis 1979), 0.3 to 1 m tall (flowering stem), tufted, stems wiry. Leaves mostly basal, ligule 0.1-0.2 cm, blades fine, 5-20 cm long, 0.1-0.2 cm wide, rolled inward. 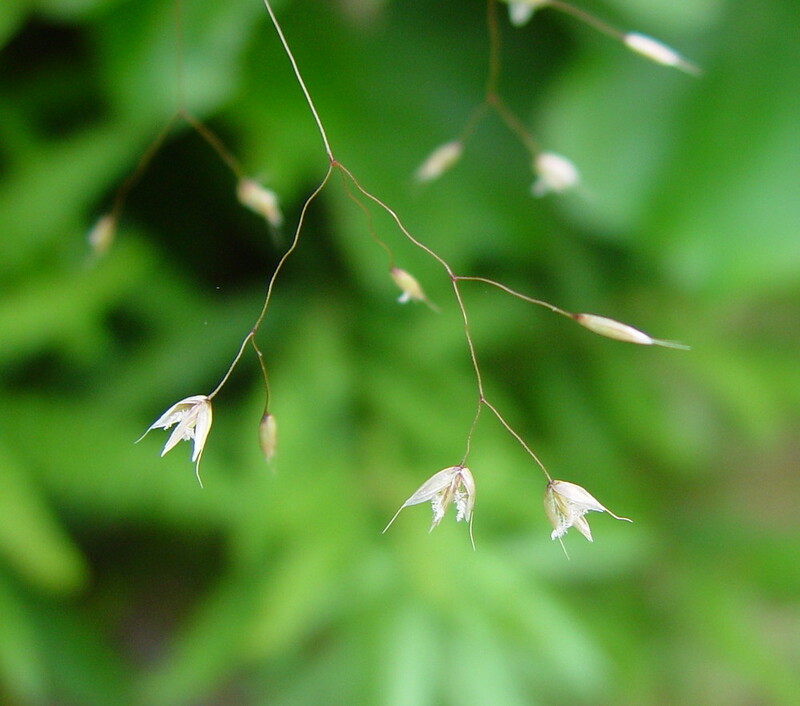 Deschampsia flexuosa inflorescence. By Arthur Haines. Copyright © 2018. New England Wild Flower Society. gobotany.newenglandwild.org (Accessed 2/2018). 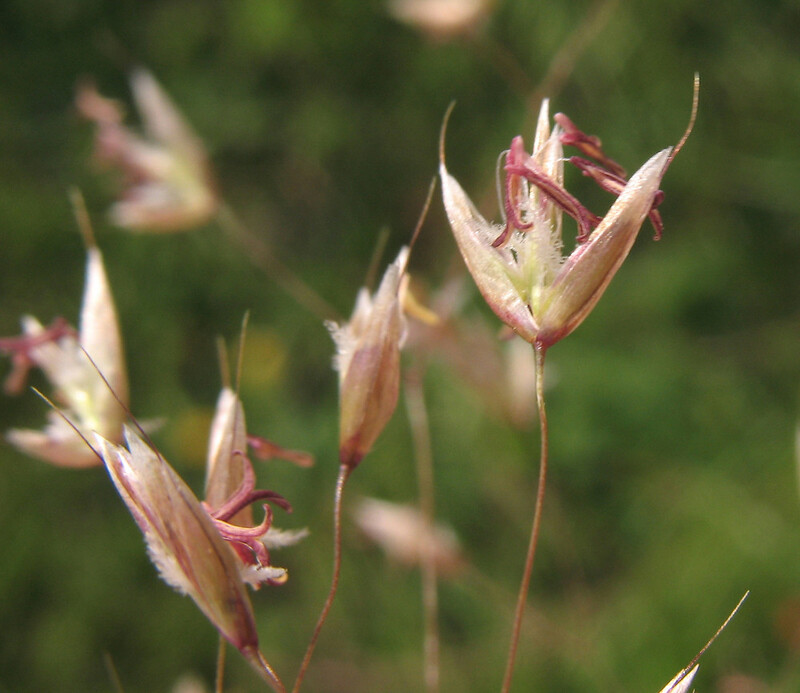 Flower spikelets purplish or silvery, 2-flowered, 0.4-0.6 cm, borne at ends of branches; glumes 0.3-0.5 cm, membranous, shiny, lemma tips 4-toothed, with an twisted awn 0.5-0.7 cm long arising from near base; inflorescence 5-15 cm long, open, sparse, branches thread-like, nodding; blooms and fruits June-Aug.
Deschampsia flexuosa spikelets. By Marilee Lovit. Copyright © 2018 Marilee Lovit. New England Wild Flower Society. gobotany.newenglandwild.org (Accessed 2/2018). Habitat: Dry, open woods, fields, acid soil pH 4.8-6.8; tolerant of shade and fire, intolerant of salt (USDA, NRCS 2010).